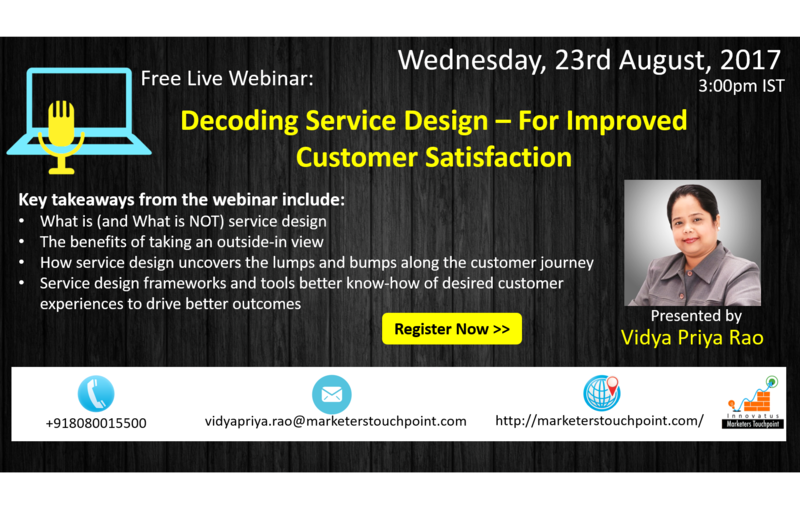 This webinar, led by industry expert Vidya Priya Rao, Founder – Innovatus Marketers Touchpoint LLP, will help you gain a greater understanding of therole that service design plays in achieving your customer experience transformation goals. Not free on 23rd? Sign up anyway, we’ll send you the recording. Presented by: Vidya Priya Rao, She is a customer experience, service design thinking, marketing, and sales consulting professional with 18+ years of experience. Her blogs are featured among the top 75 CX blogs in the web by Feedspot. She is the Program Director, Design Thinking for MDP at N. L. Dalmia Institute of Management Studies and Research. She is a certified business and executive coach.